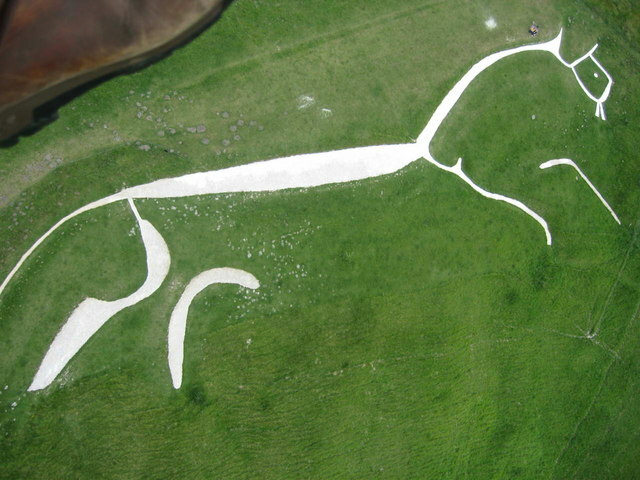 Only a quarter of a century ago the White Horse of Uffington, a chalk outline figure cut into White Horse Hill on the Berkshire Downs, was thought to be about 2,000 years old. Now it has been re-dated to three and a half thousand years old. It is an amazing sight; 360 feet long (110 metres) created by deep trenches in the hillside filled with white chalk. It is similar in design to Celtic sketches of horses and may have been originally created as a fertility symbol or to honour the sun as it has a relationship to the sun’s path across the sky at certain times of the year. One mile to the west lies Wayland’s Smithy long barrow and beneath the horse figure is a natural amphitheatre that overlooks Dragon Hill. The site is now in the care of The National Trust as an ancient monument and there is regular cleaning undertaken as without this the figure disappears. These are called ‘chalking days.’ The White Horse may have been referred to in the Red Book of Hergest in medieval Welsh literature. In 1978 David Bedford wrote ‘Song of the White Horse’ about it. Probably the best view of the figure would be from overhead but the National Trust has banned the flying of drones over the site. Recent changing weather patterns mean the site is temporarily closed due to erosion and slippage. Location: It is clearly visible from the B4507.